I think I have officially fallen down the rabbit hole and entered the world of Fountain Pens. As I have been learning more about this scary world I kept coming across the following name "Parker 51". After a quick google search, so begun my obsession with purchasing one. Many months of failed eBay bids and not finding one that caught my eye I stumbled across a Burgundy/Silver Parker 51, £32 now poorer I have had this stunning looking pen for a few weeks now. During this time I have found things I really like and something's that I haven't. Lets start off with what I have enjoyed. For me it is all about the design, it's a stunning looking pen. The burgundy barrel colour works really well with the silver cap. The pen feels light while at the same time feeling strong and durable. The area where you grip the pen curves over the nib so you only see the tip of the nib, this adds to the wonderful design of the Parker 51. 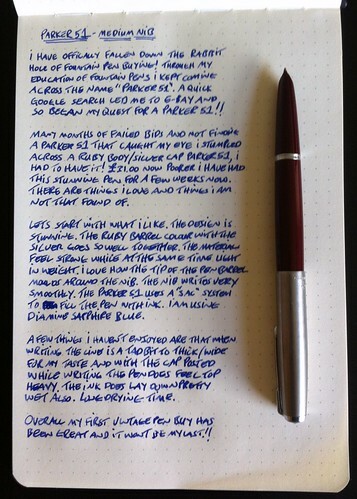 The nib itself writes very smoothly and with very little feedback. The Parker 51 doesn't take cartridges, it uses what is called a "Sac" system. This means there is a section of metal that looks like a cartridge but in the middle of this there is a plastic area covered with a thin metal strip. You dip the nib into the ink and then press the metal/plastic in four times. This causes this plastic area to fill up with ink. I filled my Parker 51 with Diamine Sapphire Blue. A few things I haven't enjoyed are that when writing I find the line to be pretty thick and lays down wet. There definitely is a longer drying time that other fountain pens I own. When I post the cap I find the Parker 51 feels top heavy, it doesn't feel balanced. I find I don't post the cap as it makes for a more enjoyable writing experience.